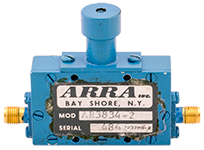 Arra continously variable attenuator. 0 - 10 dB, 2 - 4 GHz, 10 watts. Form factor 0 - 51. "N" connectors. 5" diameter. 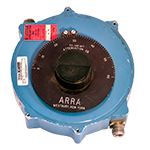 Arra continously variable attenuator. 0 - 10 dB, 2 - 4 GHz, 50 watts average. Locking dial. 5" diameter. Used. 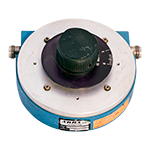 Weinschel continuously variable attenuator. 0 - 20 dB, 2 watts. "SMA" female. 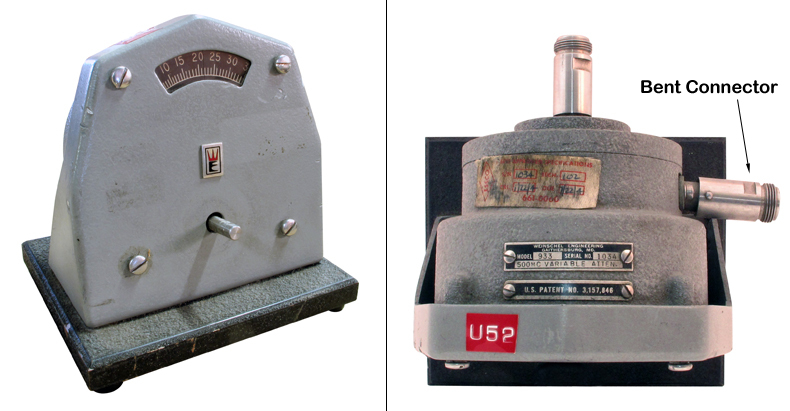 Includes 2" dial and knob. 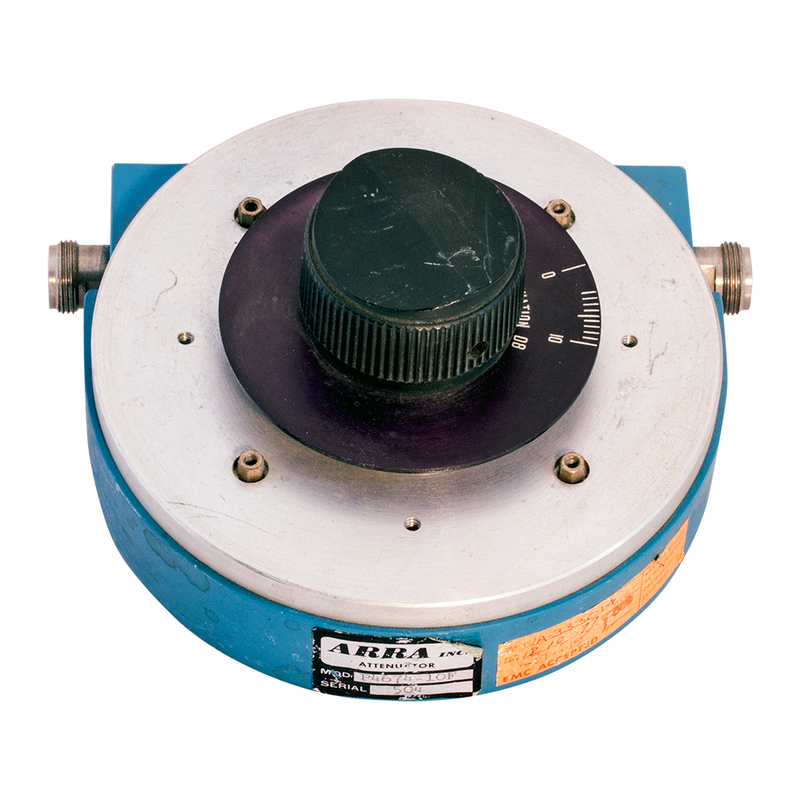 Mounts by 3 standoffs under dial on 1-1/8" centers. Body: 1-5/8" diameter, 2-1/4" behind panel depth. 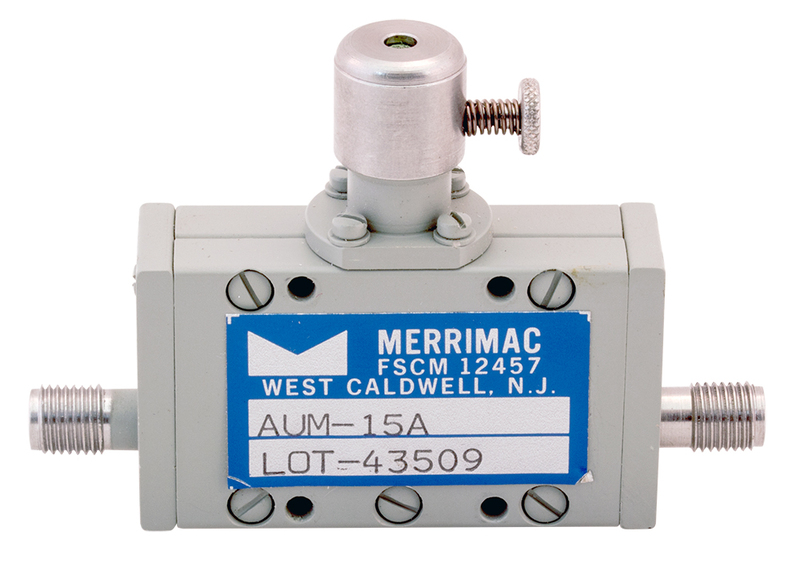 Merrimac variable attenuator. 0 - 20 dB, 1 - 8 GHz, 50 ohms. Slot adjust. "SMA" female connectors. 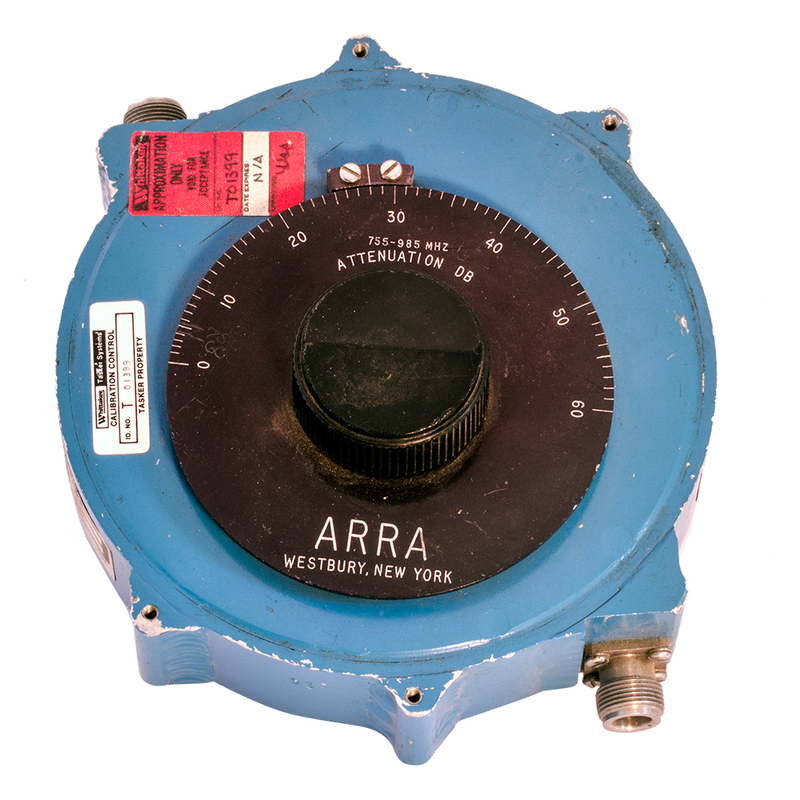 Arra variable attenuator. 0 - 20 dB, 2 - 8 GHz, 50 ohms, 2 watts. Slot adjust. "SMA" female connectors. 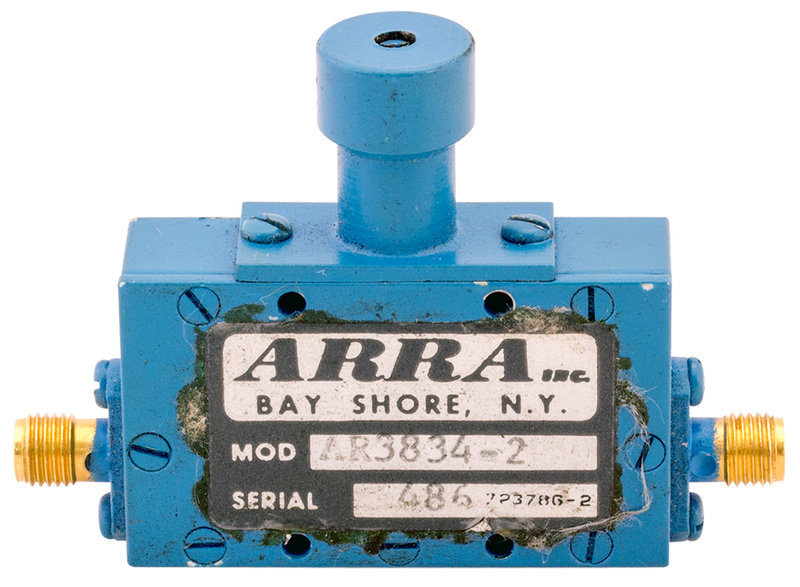 Arra continously variable attenuator. 0 - 30 dB. Directly calibrated. "BNC" (F) - "BNC" (F), 50 ohms. 0 - 0.1 GHz, 1w, 0.5 dB insertion loss. Locking knob. 1-1/2" x 1-1/2" x 3-5/8" overall. New, unused. 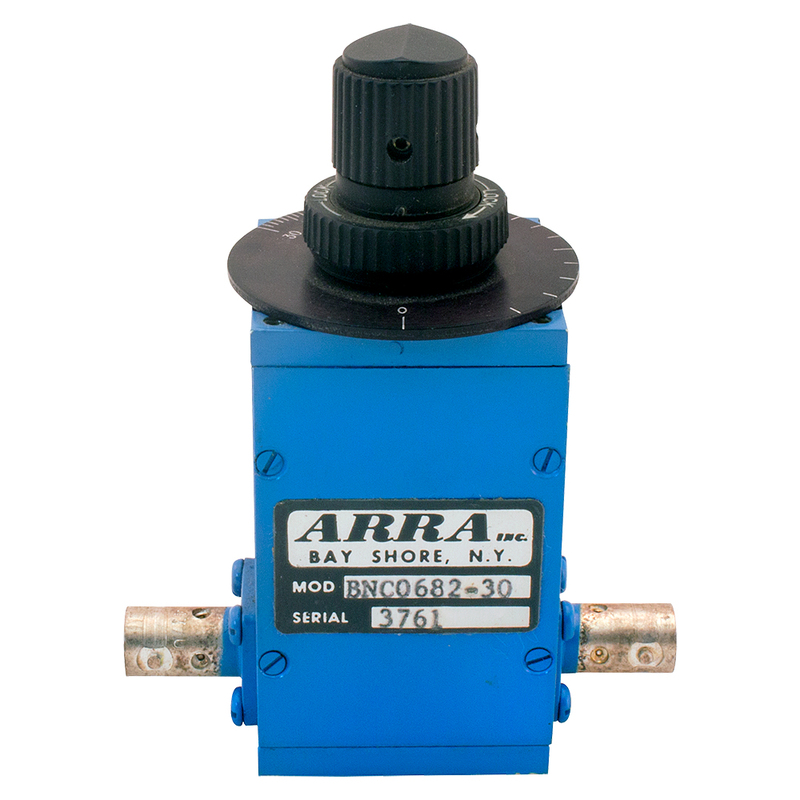 Arra continously variable attenuator. 0 - 30 dB ±1 dB. 12.4 - 18 GHz. VSWR: 1.50 max. 10 watts average, 5 kw peak. "SMA" female connectors. Used. 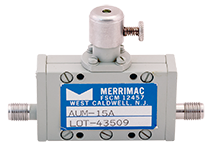 Merrimac micrometer adjustable attenuator. 1 - 8 GHz, 0 - 30 dB, 50 ohms, 4 watts average. "N" male / female connectors. Brand new, unused. 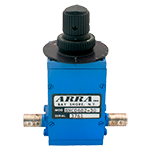 Arra continously variable attenuator. 0 - 60 dB, 755 - 985 MHz, 10 watts. 6" diameter. 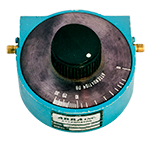 Airborne Instruments Lab precision continously variable attenuator. 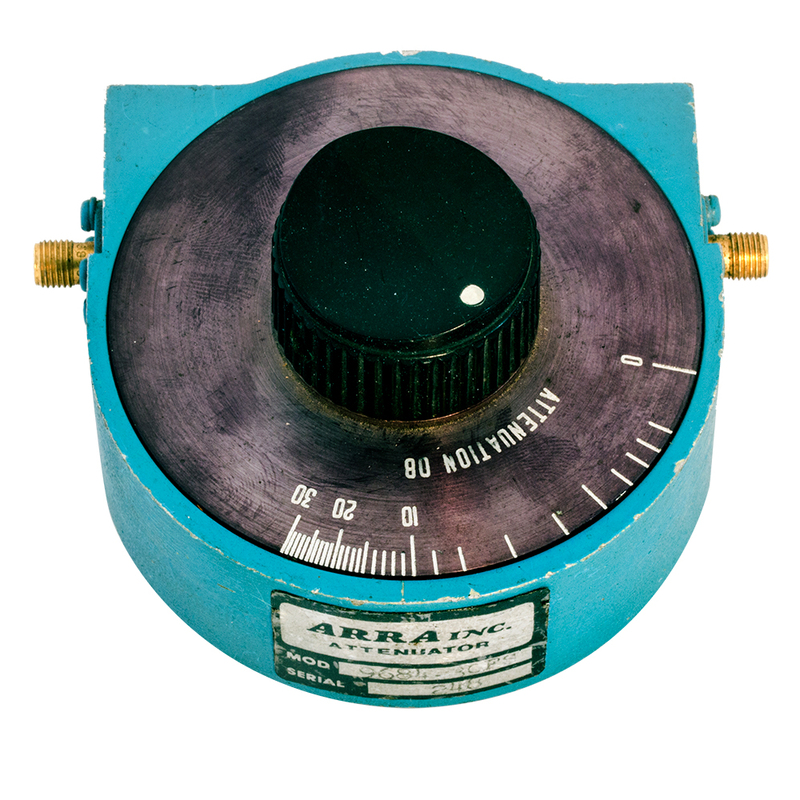 0 - 80 dB, 50 ohms, 30 mcs. "BNC" female connectors. Wood case. 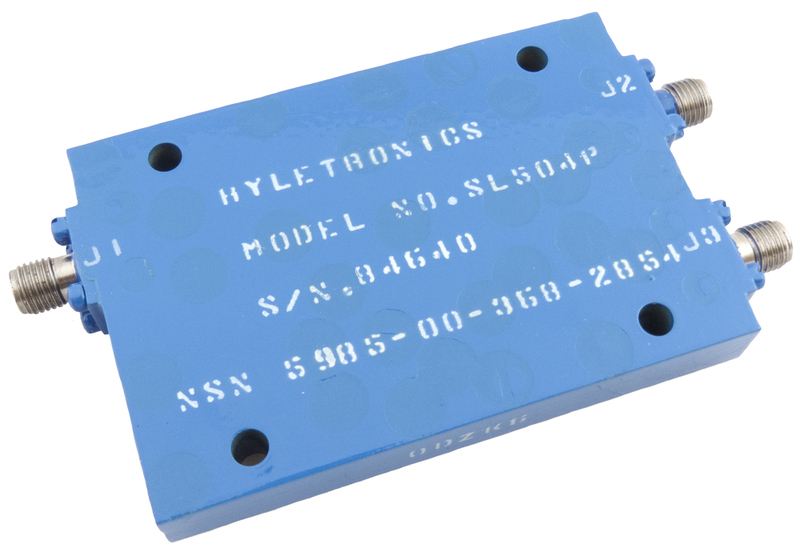 Hyletronics variable attenuator. Attenuation range: 0.01 - 120 dB. Current controlled. 5 MHz-2.6 GHz. 100 watts max. SMA connectors. 1-1/2" x 1-7/8" c-c mount holes. 1.85" x 2.73" x 0.383". New - unused. DLA900-92-M-7745. NSN: 5985-00-368-2854. 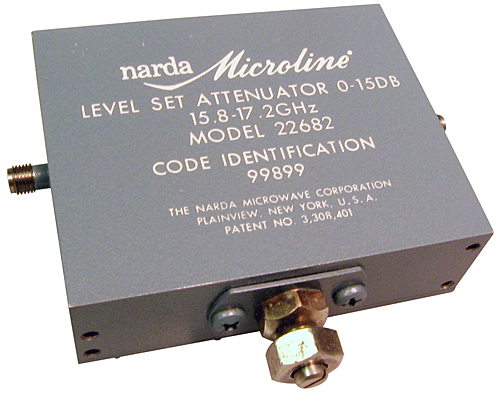 Narda variable attenuator. 15.8 - 17.2 GHz. 7 turn. "SMA" connectors. Slot adjust. 3-5/8" x 2-1/4" x 1" deep. 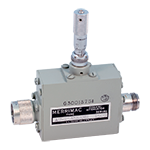 MCC Norsal digital attenuator. 2.0 - 18.0 GHz, 105 dB, TTL & ±15 vdc. "SMA" female in / out. DB-15 connector & cable. Dimensions: 2" x 2-1/2" x 1". 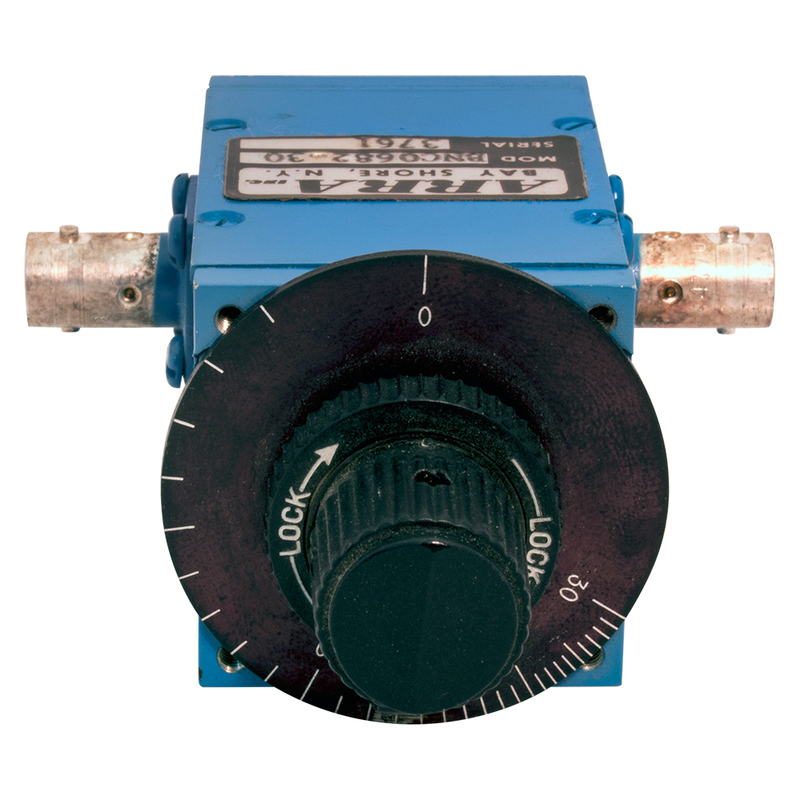 MCC Norsal voltage controlled attenuator. 2.0 - 18 GHz. "SMA" female in / out. ±15v. Dimensions: 2" x 2-1/2" x 1". Used. 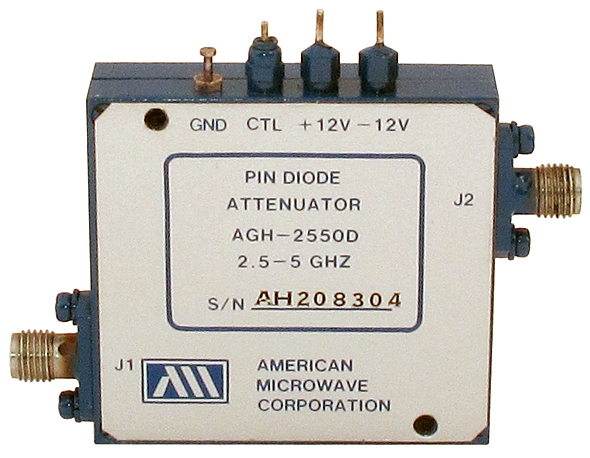 American Microwave Corporation pin diode attenuator. 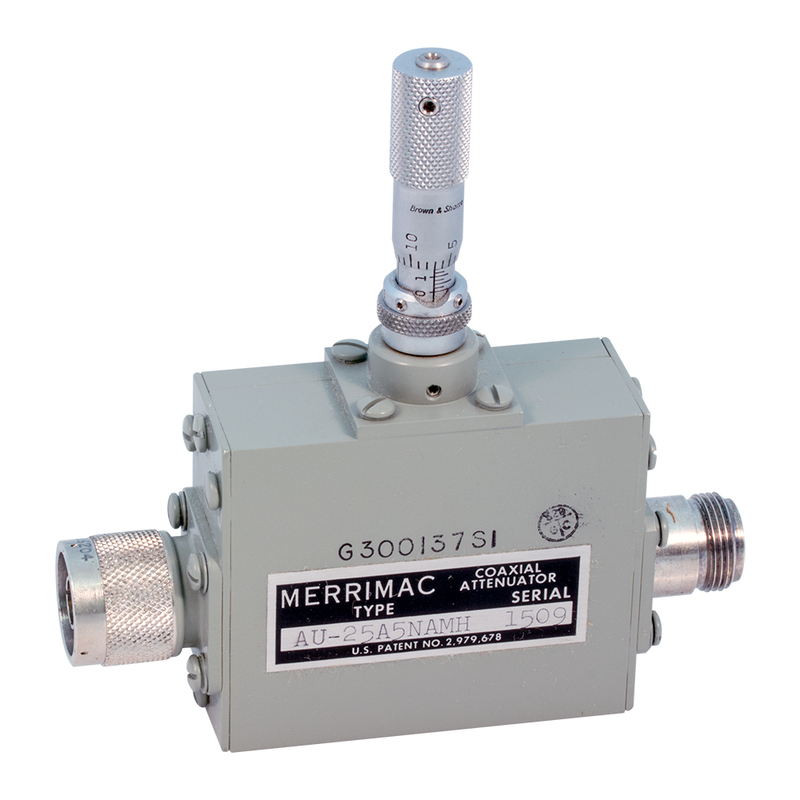 2.5 - 5 GHz, 0 - 60 dB, 20 dBm power handling. 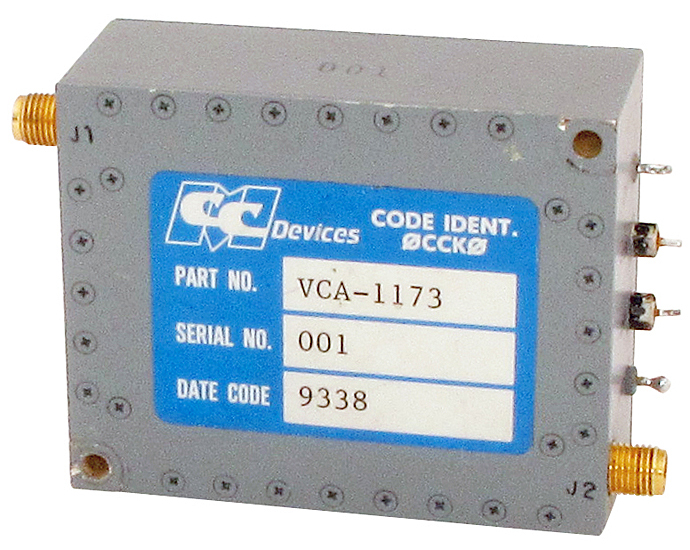 ±12 vdc, 5v control. "SMA" female connectors. Measures 1-5/8" x 1-7/8" x 9/16". Brand new!! 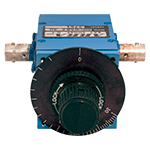 Weinschel cavity style variable attenuator. 0 - 120 dB @ 0 - 500 MHz. "N" connectors. This unit is defective. Dropped, bent part, missing knob.